I would be seriously keen to find this out: What difference is there between the frequentist interpretation of probability and simply a restatement of the Law of Large Numbers? Because I kind of can't see any. And why is the LLN never brought into any such discussion of probability interpretations? One of the good reasons I see argued for secret-ballot elections is, "It prevents employers, union bosses, etc., from demanding a certain vote and then verifying it afterward." Although in the modern era, you could step into a booth with a ballot, fill it out, take a private camera-phone shot of it with your license in view, and then be required to present that photo to your employer, et. al. There's nothing to prevent that at my polling place, for example. Just a thought. By relieving the brain of all unnecessary work, a good notation sets it free to concentrate on more advanced problems, and, in effect, increases the mental power of the race. Before the introduction of the Arabic notation, multiplication was difficult, and the division even of integers called into play the highest mathematical faculties. Probably nothing in the modern world would have more astonished a Greek mathematician than to learn that … a large proportion of the population of Western Europe could perform the operation of division for the largest numbers. This fact would have seemed to him a sheer impossibility … Our modern power of easy reckoning with decimal fractions is the almost miraculous result of the gradual discovery of a perfect notation. [...] By the aid of symbolism, we can make transitions in reasoning almost mechanically, by the eye, which otherwise would call into play the higher faculties of the brain. [...] It is a profoundly erroneous truism, repeated by all copy-books and by eminent people when they are making speeches, that we should cultivate the habit of thinking of what we are doing. The precise opposite is the case. Civilisation advances by extending the number of important operations which we can perform without thinking about them. Operations of thought are like cavalry charges in a battle — they are strictly limited in number, they require fresh horses, and must only be made at decisive moments. 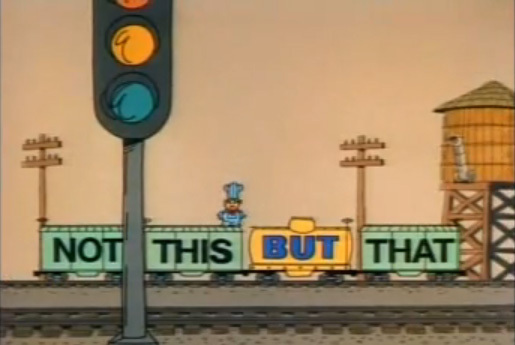 So the other night while I was recovering from class, I wound up on YouTube watching the "Conjunction Junction" video, from the Schoolhouse Rock series that was broadcast after Saturday-morning shows on ABC all through the 1970's and 1980's. I was kind of surprised by how irritated it made me in one small detail. I've grown accustomed to teaching the standard logical operators in all of my classes -- whether they be fundamentals of math, introduction to computers, statistics and probability, etc. 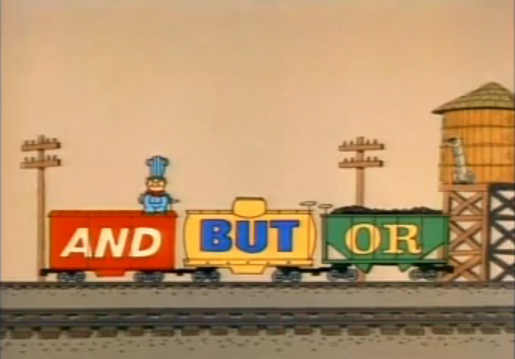 So when the song starts and says, "I got three favorite cars/ That get most of my job done", well, of course I expected to see "And/ Or/ Not" -- but then what actually appears (as you can see in the top picture) is "And/ But/ Or". So, I was surprised at how jarred I was by that. Wait a minute, that's not right! The truth is, the word "But" has the exact same logical meaning as "And" (both clauses are true); all it does is put an interpretive spin on the latter clause, as if to say "this second part may be somewhat surprising to you". And in fact, in order to make the argument that "that's sort of the opposite", they had to go and use the missing logical operator than actually does make things "opposite", namely "Not". Watch video here. Or: Read lyrics here. Say that in Latin (with "-illion"). Now, obviously this requires you to do a few elementary operations in your head and to also know Latin (or at least how to count therein). And: I'm doing this in the "short scale", of course. Example #1: 1.01238 x 10^18. Do 18/3-1 = 6-1 = 5. So this is about "one quintillion". Do 48/3-1 = 16-1 = 15. So this is about "two quindecillion". Do 95/3-1 = 31-1 = 30. Since we had a remainder of 2 at the division step, I'll say this is about "six hundred trigintillion".